Is it worth establishing your core values? Developing your people: By ensuring that the core values are understood throughout all layers of the organisation, incorporating them into individual targets and using them to measure and reward individual performance, they become the heart of your culture. The important thing is to ensure that they are lived in the day-to-day functioning of the company, not just rolled out at induction by HR. They can also be an invaluable in determining the right course of action when things don’t go quite as planned! Recruiting new staff: By allowing your core values to guide your hiring decisions, you increase the odds of recruiting people who best fit your team which can lead to increased employee engagement and employee retention. Managing customer relationships: Communicating internally and externally about your core values can help you attract customers with similar values, ease the process of the setting of customer standards and of aligning expectations between customers and your staff. Building the brand: In this customer-driven marketplace, it’s important that customers feel something about the brand. Instilling your values in your brand helps you to stand out, communicates externally what you stand for and how you fit into your customers’ world. Expressing core values in terms of metaphors can help bring them alive. Some people recommend avoiding using individuals as these are more influenced by personal perceptions. For example, not everyone was a fan of Margaret Thatcher, but most people agree that a reliable, effective and energy efficient washing machine is a desirable one! 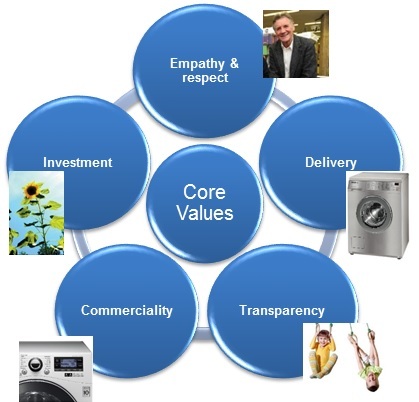 The diagram is an example of the core values of a business and associated imagery. 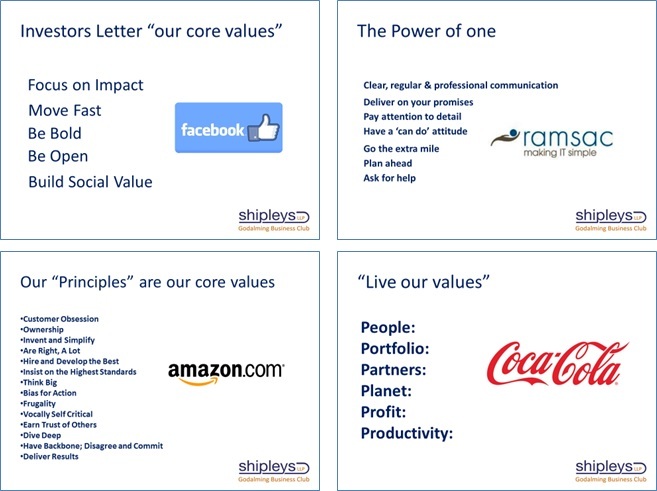 Note how unique the values are to each organisation and how these values really are part of these brands’ DNA.